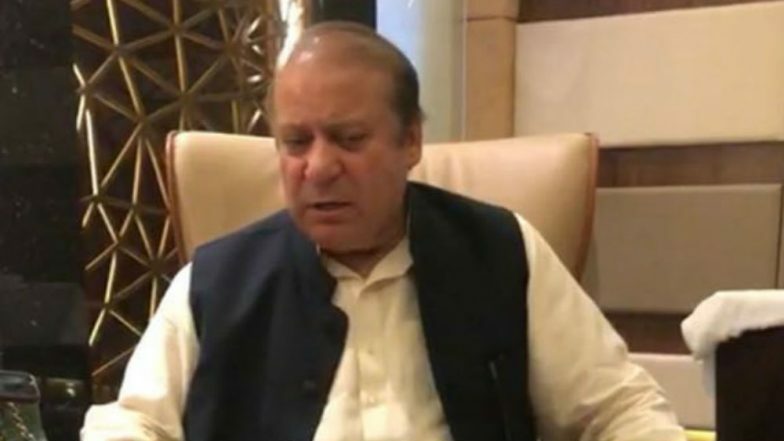 Islamabad, March 26: The Supreme Court of Pakistan on Tuesday granted bail of six weeks to former Prime Minister Nawaz Sharif for health reasons. Sharif, 69, has been serving a seven-year sentence for corruption. "A three-member bench headed by the Chief Justice granted bail to Nawaz Sharif for six weeks," Supreme Court spokesperson Muhammed Furqan told Efe news. The spokesperson said that the former Prime Minister had to deposit two bail amounts of 5 million rupees each (total of around $70,000) and will not be allowed to leave Pakistan during the six-week period. Sharif's lawyer Khawaja Haris said in court that his client was suffering from kidney problems and angina pectoris. In February, the High Court of Islamabad refused to suspend Sharif's sentence while hearing an appeal or grant him bail on medical grounds. Nawaz Sharif Needs 'Aggressive Medication' to Avoid Cardiac Complications. In December, the three-time Prime Minister was sentenced to seven years in prison and a fine of $2.5 million after a ruling that Al-Azizia Steel Mills -- a Saudi Arabian firm carrying the name of Sharif's son -- belonged to the former Prime Minister who could not demonstrate how the project was funded. In July, a judge of the National Accountability Bureau, Pakistan's top anti-corruption organization, sentenced Sharif to 10 years in prison for corrupt practices in connection with owning luxury properties in an upscale London neighbourhood. His daughter Maryam was jailed for seven years. Both were imprisoned, but in September the sentence was suspended by the High Court of Islamabad while an appeal was heard concerning that case. In July 2017, Pakistan's Supreme Court ousted Sharif as Prime Minister and barred him from public office for life after an investigation spurred by the publication of the Panama Papers found that he failed to disclose payments from a company belonging to his son. The Panama Papers revealed in April 2016 that three of Sharif's four children had set up offshore companies in the British Virgin Islands through which they owned property in London, leading the top court to order an investigation after a year of protests by the opposition.